When it comes to preparing for an emergency, most of us have a collection of first aid items on hand to use in case of an injury or illness. 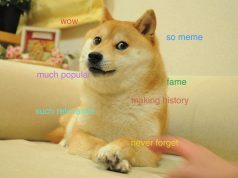 It should be no different for your furry friends as well. 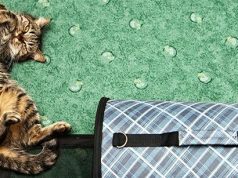 Keeping a few, simple items and knowing how to use them can really help your kitty in times of need. Just remember, cats can be difficult to treat, to say the least. 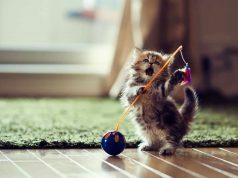 An important first step to giving your cat any sort of medication or treatment would be to learn some handling techniques so that you yourself don’t end up needing some first aid. This holding technique works well to give Kitty oral medications. Start by laying out a large, thick towel on a table top or other flat surface. Starting at one end of the towel, roll your kitty up in the towel making sure that his front feet and down at his side, leaving only his head sticking out of the burrito. Wrap snuggly enough that he can’t easily free his legs, but not so snug that he can’t breathe. If you have someone to help you, they can then safely hold the kitty while you give the oral medications. 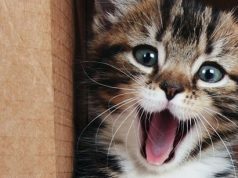 Here’s a great video from Cat Depot on how to do it yourself. This also works if you need to treat a sore or injured paw, front or back. Just leave the affected paw sticking out of the towel when you wrap. If kitty tends to be a biter, you can cover his head loosely with another towel. Most of us cat owners should know the scruffing technique. It’s a natural motion that mother cats use to carry their young. It also works well to control a cat’s head without causing any discomfort. Simply gather the loose skin on the back of the neck in one hand. From here you can lift the kitty if they’re not too heavy, or just keep them from biting. It also naturally pulls back the lips and opens the mouth if you need to give oral medication. Here’s Dr. Christianne Schelling demonstrating the technique. Giving your cat a thick towel or blanket to sit on while doing this will give them something to sink their claws into instead of your arm. This way you have feet and teeth mostly in control and can continue with your treatment. This is for two or more people only. One person scruffs your purry pal and lays him on his side. Your helper’s other hand grabs the hind legs and gently stretches them back into a position that makes it look like the kitty is running through a meadow. This leaves you open to controlling the front legs and treating whatever it is you’re looking to do with the kitty. It’s never a bad idea to have some canned food on hand, especially if your kitty is used to eating just dry kibble. Canned food proves to be very enticing and some oral medications can be ground up and hidden in the canned food. This spares everyone’s fingers and also Fluffy some stress. Canned food can also stimulate a weak appetite. It is imperative that cats eat everyday, even if it’s just a little bit. Not eating can lead to liver problems. Offering some canned food may get your otherwise anorexic kitty to eat or it can be mixed with water and force fed if need be. 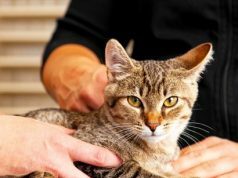 Now that we’ve all mastered some cat handling techniques on how to keep ourselves out of harm’s way, let’s talk about what you should have on hand to help your kitty through an injury or illness situation. Note: You should only have these items in case of an emergency and only give them under the guidance of a veterinarian. Most commonly used as an antiseptic and wound cleanser, hydrogen peroxide double duties as a vomit inducer in cats. This is especially important as some cats are orally fixated and ingest lots of objects that they shouldn’t. A common one would be rubber bands, hair ties, ribbon, or string. This also can include foods, cleaners, etc. When using hydrogen peroxide, it’s important to know what your kitty ate. Caustic or corrosive substances should not be vomited back up as they can cause more damage. It’s also important to use within four hours of ingestion for best results. The dose of hydrogen peroxide is one teaspoon for most cats. This is based on an average weight of 10 pounds. This dose can be given every 10 to 15 minutes for 3 to 4 times or until vomiting occurs. It’s definitely best to do this outside if possible as it typically gets pretty messy. Since most cats are avid groomers, they tend to ingest gobs of hair. Most of the time this is not an issue as the hair moves through the GI tract uninhibited. However, in some cats, the hair collects in the stomach and forms a hairball. Sometimes cats are able to vomit hairballs back up, but other times they can get lodged in the intestines. Cat Lax or other type of laxative designed for our kitty pals works well to grease the skids so to speak to move the hairball through. It doesn’t cause diarrhea necessarily, it just lubricates the situation a bit. 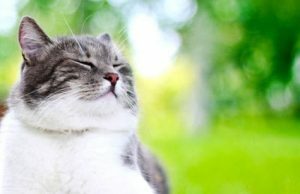 For some kitties with chronic hairball issues, Cat Lax can be given as a preventative measure on a daily or weekly basis. If you don’t have Cat Lax on hand, Vaseline will do the same, however it is unflavored and less likely to be taken as well by your cat. 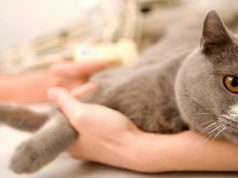 For mild to moderate arthritis, strains, or sprains, cats can have aspirin. This would only be a temporary medication, usually just a single dose, to use until your veterinarian can be seen. Aspirin should not be used if there is active bleeding or for a prolonged period of time. The cat dose for aspirin is ½ to 1 80 mg baby aspirin every two to three days. Again, this and any of the other therapies should only be used in a pinch until you can see your veterinarian. Use on minor cuts or scrapes to help kitty heal faster. The main thing to remember with this is contact time is important. This means you may need to cover the area after application in order to keep cat tongues away. Triple antibiotic ointment can also be used in irritated or injured eyes. Cat claws make perfect weapons to scratch eyeballs and eyelids, so eye injuries can be common in multi cat households. Triple antibiotic ointment can be used in these eyes as a first line of defense until you get to the veterinarian. Vet wrap is a miracle bandage for all critters, including the human kind. It works well to cover wounds, stop bleeding, and for supportive bandages. It is self-adhesive meaning it sticks to itself and not other things such as wounds or hair. This makes it great for our furry friends. It also comes in a variety of colors and patterns for those kitties that have to use it long term. When using vet wrap, it is important to remember that it is a stretchy bandage so wrapping it too tightly can be a concern. Just make sure you can slip a finger or two under any bandage you apply. This is used hand-in-hand with vet wrap. Since vet wrap only sticks to itself, you may need to add a strip of white tape to your bandages to stick it to the hair. This helps keep the bandage in place, especially if kitty wants to lick or chew at it. Be aware that it will probably pull some hair when removed so just be slow and careful. Kitties get upset stomachs too. This can be accompanied by mild vomiting and diarrhea. Pepto Bismol can be used to help soothe these symptoms in our kitties that may have eaten something they shouldn’t have and have a mildly upset stomach as a result. The dose for Pepto Bismol is ½ to 1 teaspoon every 12 hours for no more than 3 to 4 doses. If there is no improvement following this regime, it would time to see your veterinarian. If your kitty’s curiosity for bugs and bees leads to bites and stings, Benedryl is a great medication to help decrease swelling, itching and burning associated with these issues. It can also be used to help decrease car sickness for those traveling felines. 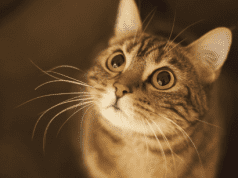 The dose for Benedryl is 2 to 4 mg per cat. Obviously, smaller cats should receive the lower dose and larger cats receive the larger side. Also, larger doses can lead to sedation, so keep that in mind when treating. The children’s liquid version works the best in these situations. Plain yogurt is a great source of natural probiotics. 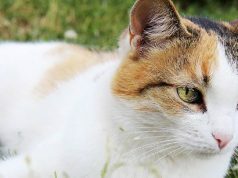 Probiotics become important in kitties that are ill or on antibiotics. Probiotics help to maintain a healthy GI tract and prevent diarrhea. Plain yogurt has less sugar than flavored and most cats will readily eat it. Just give them a couple teaspoons with their meal for the duration of the medication or illness. Since most of these products are useful for humans, it makes it very easy to keep stocked for cat first aid as well. Just exercise proper precautions when working with your kitty and know how to use the products discussed. It can really make a difference when faced with an illness or injury. 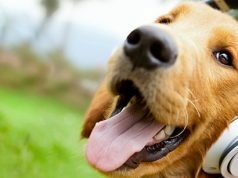 However, remember to always contact a veterinarian and scheduling an appointment before trying any of these treatments. We just want to make sure you are prepared in case you need to give them in emergencies.